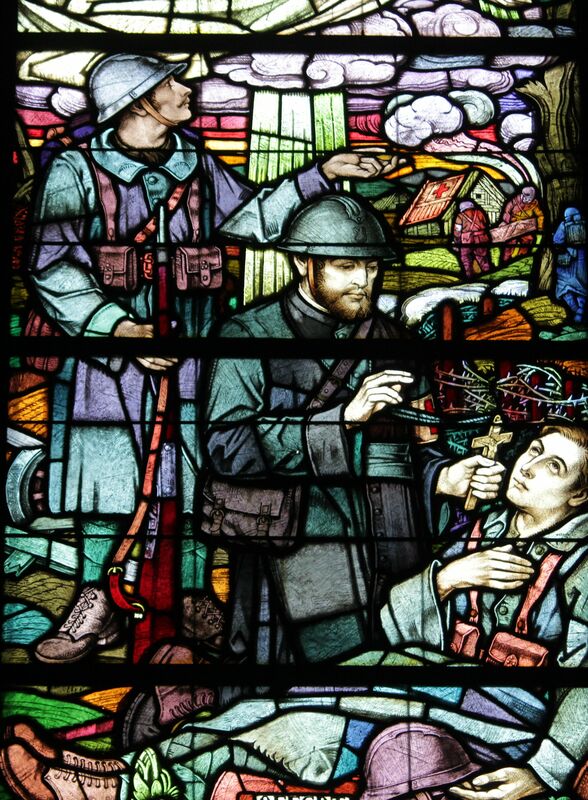 L’église de l’Emm, Mémorial de la Première Guerre mondiale: a post for 11th, 11th, 2014. L’église de l’Emm takes its name from Emma, niece of Charlemagne, who founded a hermitage on this colline near Metzeral in memory of her fiancé, Roland de Roncevaux, in the fifteenth century. 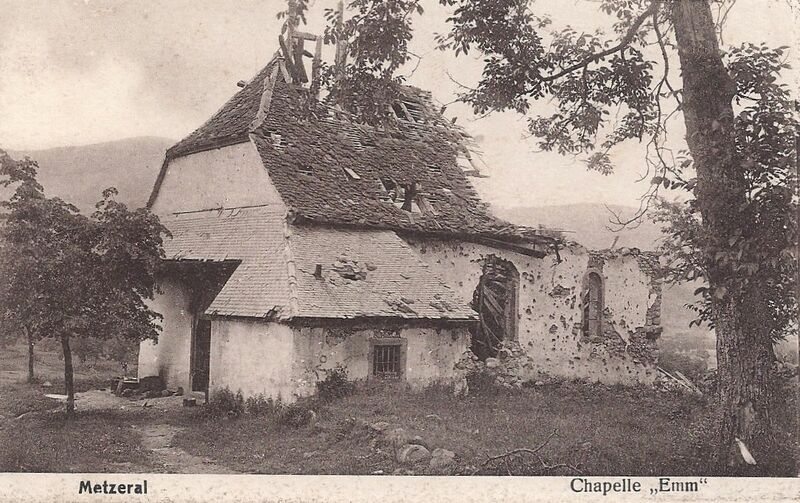 Through the next five centuries, the original chapel was variously destroyed, rebuilt, rededicated, refounded and eventually wrecked in the Battle of Metzeral (15th – 21st June, 1915). After the war, the ancient chapel stood in ruins. Curate Martin Behe arrived in the Fecht valley in 1921 and was deeply affected by the damaged valley, dreadfully scarred by warfare and the resting places for thousands of French soldiers, some in the cemeteries and some lost possibly forever in the mountainous landscape of the Vosges. He urged the construction of a memorial. The colline was designated as the site for a church consecrated to the memory of the soldiers who fell in the Vosges, particularly those who died in the battle for Metzeral and who still lie in the Vosges. It was to be a focus for families to remember their husbands, their fathers, their sons, their neighbours, and people were encouraged to contribute. The site of the old chapel was chosen and a new church was built as église-mémorial de l’Emm. It is an expression of mourning and of gratitude by the people of Alsace. The project was overseen by a committee under the banner Souvenir Alsacien, which included the bishop of Strasbourg and General Pouydraguin. Fundraising took place across France and abroad. 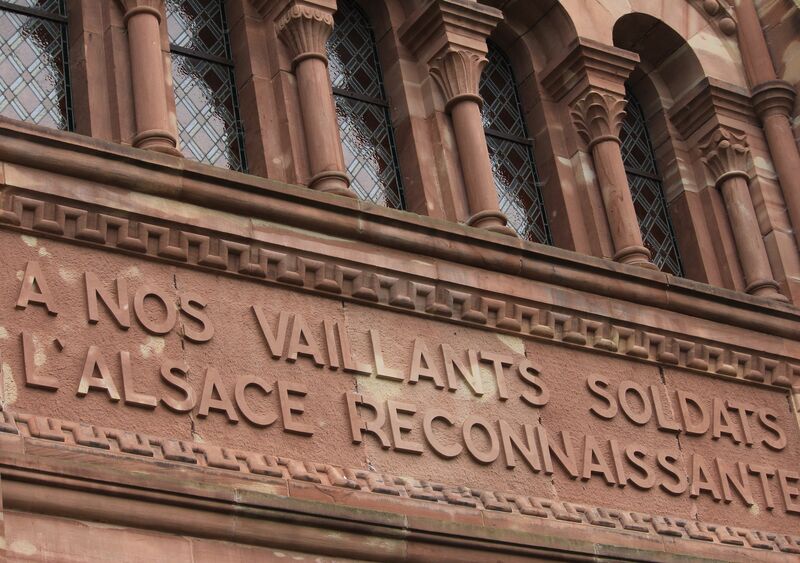 The builders used local red sandstone (the same as was used for the cathedral in Strasbourg) and prominent on the façade is the inscription expressing the gratitude of Alsace: “À nos vaillants soldats, l’Alsace reconnaissante”. The building was finally dedicated on October 4th, 1931 and the bells were dedicated nine months later in July 1932. I believe the bell tower contains four bells. One is intended to evoke the majestic sound of the bell in the ossuary at Douaument. Inside, the walls are lined with 1.80m high marble panels, each engraved with the names of the soldiers who died in the battle for Metzeral. Stained glass windows throw their saturated light on to the light marble. It is a profoundly peaceful place which encourages reflection. One window depicts a chaplain ministering to a dying comrade among the debris and flashing lights of the battlefield. It is called, simply, ‘Nos morts’. Metzeral is 6.5 km west of Munster, in the valley of the river Fecht. Control of the valley was important for both sides and military operations took place there early in 1915, coinciding with the intense fighting at Hartmannswillerkopf. The battle for Metzeral in June 1915 tends to be overshadowed by the bitter struggle for Hartmannswillerkopf and (beginning just one month later) the fierce battle at le Linge, but it was important and deadly. The combined forces of Major General Pouydraguin (47th Division) and General Serret (66th division) were deployed to remove the enemy from the upper valley of the Fecht. Initially they were unsuccessful and the two generals decided to carry out a major assault. The populations of the villages or Metzeral and Sondernach were evacuated on June 9th and the attack began on June 15th. The main action took place on 20th and 21st June, with heavy fighting street by street, building by building, hand against hand, bayonet against bayonet. The village was ruined beyond recognition, the tranquil river valley destroyed. By the 24th June, the French had secured Metzeral but the human cost was devastating. The French cemeteries of Chêne Millet and Sondernach, the German cemetery of Breitenbach, are witness to the losses in the valley of the Fecht. Categories: Alsace at War - 1914-1918, Buildings, Centenary 1418, Vosges, War in the Vosges - 1914-1918 | Tags: Alsace, Centenary 1418, Chapelle d'Emm, First World War, Great War, L’église de l’Emm, Metzeral, Vosges | Permalink.